Footfall in September declined by 1.7% on the previous year – a slight acceleration on August’s fall of 1.6% – according to the British Retail Consortium (BRC) and Springboard. 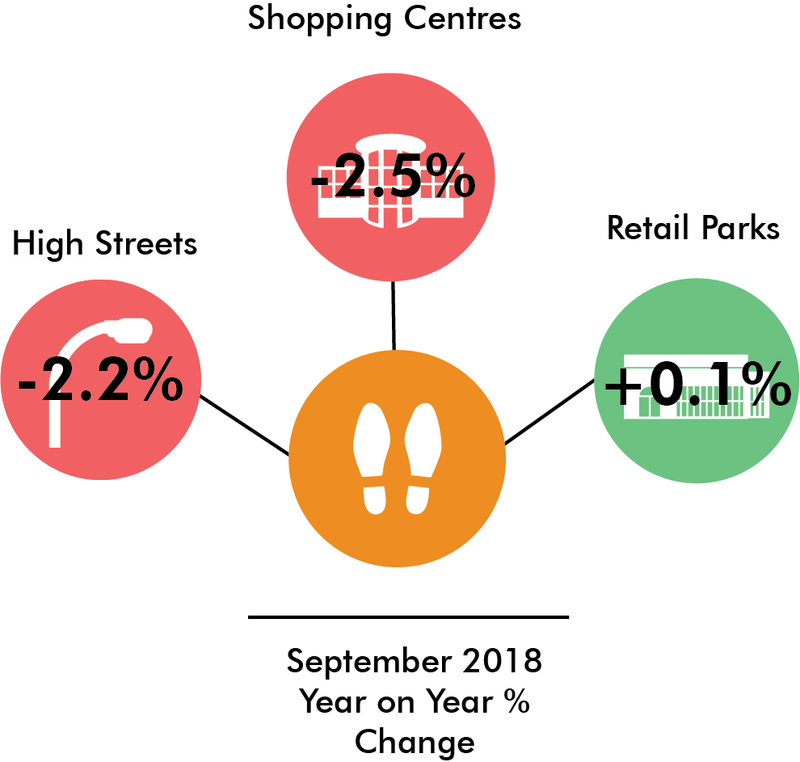 Covering the five weeks from August 26 to September 29, the BRC-Springboard footfall report said that High Street footfall decreased by 2.2%: its second month of consecutive decline. High Street footfall fell in all regions, with Wales and Northern Ireland seeing the deepest declines at 7.9% and 6.1%, respectively. Retail park footfall growth slowed by 0.1% in September from 0.3% in August. The East saw a negative swing from +5.1% in August to -5.6% and Northern Ireland saw an end to its four-month growth, falling by 6.1%. 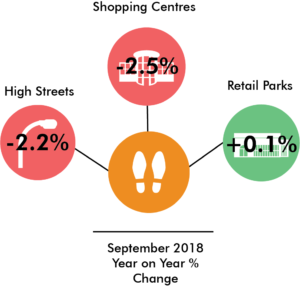 Shopping centre footfall continued to decrease at a decelerated rate: in September it fell by 2.5%, compared with August’s fall of 2.4% and July’s drop of 3.4%. September is the eighteenth consecutive month of decline. The report concluded: ‘No region saw growth in September. The East experienced a sharp decline by 5.3% from 1.7% in August and footfall in Wales also fell sharply by 5.5% on the previous year. ‘Some of this is down to the unrelenting pressure on households’ budgets. With sluggish wage growth and inflation ticking upwards – the BRC-Nielsen Shop Prices recorded its second month of inflation in over five-years in September – it’s no surprise that consumers are cautious about their discretionary spending. BRC chief executive Helen Dickinson OBE commented: “September saw a continuation of the trend for decreased footfall at UK shops, with overall figures down 1.7% on September 2017. Shoppers are feeling the squeeze of increasing shop price inflation and little real wage growth. “These footfall figures are yet further demonstration of the increasingly difficult operating environment that British retailers are facing. And yet, the country’s largest private sector employer is not seeing any action from Government to help. “The retail industry pays a disproportionate amount of tax, representing 5% of the economy and paying 10% of business tax and 25% of business rates. The system is skewed towards high taxes on people and property which is contributing to store closures and job losses, stalling the reinvention of our high streets.